A popular pub on Rosebery Avenue just by Exmouth Market, in Clerkenwell. 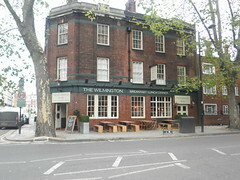 As of 31 October 2013, the pub has been rebranded as a Capital Pub Company pub and shortened its name from The Wilmington Arms photo. The comments below pre-date these changes. This refurbished pub near the intersection with Farringdon Road may use some of the cliches of the gastropub conversion — worn wooden tables with benches, bare floors, chalkboard specials — but it doesn't sacrifice any of the essential qualities of a good pub. Its additional focus on hosting a variety of events in a separate live venue ensures that there are always new crowds of young and trendy drinkers, so even on a Thursday evening the place was still just about full. The pub itself stretches back to take in two conjoined rooms, with plenty of tables and a couple of booths near the back. Out front there are benches alongside the road. The live venue space is on the other side of the bar in a side room and has a separate entrance from the street. Food is served noon-9pm Monday to Thursday, noon-4pm Friday, and 1pm-8pm on Saturday and Sunday. There's a seasonal menu, with a few snack-type foods (a bowl of chips, or hummous with pitta bread, £3.50, the latter of which came with slightly toasted pitta and a nice spicy hummous) and a variety of mains photo of menu in July 2009. A separate chalkboard lists daily specials as well as which of the Pieminister pies are on offer. Ewan's posh cheese and onion pie (£8) was perfectly decent, served with either mash or chips, as well as some slightly over-cooked peas photo. Accessibility: There is no step to get in, and although toilets are upstairs, there's an accessible toilet at the back of the ground level with a radar lock. Last visited by Ewan, Kat, Jo and others, February 2011. Opening hours taken from website, March 2011. Food times taken from menu, May 2009. Last edited 2016-09-18 16:02:46 (version 20; diff). List all versions. Page last edited 2016-09-18 16:02:46 (version 20).